* Aropec Dry Bag - waterproof, snow proof, sand proof, dustproof. Forge rivers, go kayak fishing, canoeing, or be caught in a downpour with confidence. You will love the clear see-through window panel that allows you to see what gear is inside your dry bag without unpacking. * Never worry about dropping it in water or water getting in. Unique water-tight DOUBLE overlap roll top provides the best-in-class waterproof performance. Use a versatile KastKing Dry Bag for camera, cell phone, or can double as a fishing tackle bag or travel bag. * Aropec Dry Bags keep your belongings safe for kayak fishing, camping, boating, rafting, canoe trips. Dry Bags will not replace a PFD but can be used as a supplemental emergency flotation device. It floats when sealed with air trapped inside. Having dry gear available can be crucial for your survival. Aropec Dry Bag - waterproof, snow proof, sand proof, dustproof. Forge rivers, go kayak fishing, canoeing, or be caught in a downpour with confidence. You will love the clear see-through window panel that allows you to see what gear is inside your dry bag without unpacking. Never worry about dropping it in water or water getting in. Unique water-tight DOUBLE overlap roll top provides the best-in-class waterproof performance. Use a versatile KastKing Dry Bag for camera, cell phone, or can double as a fishing tackle bag or travel bag. 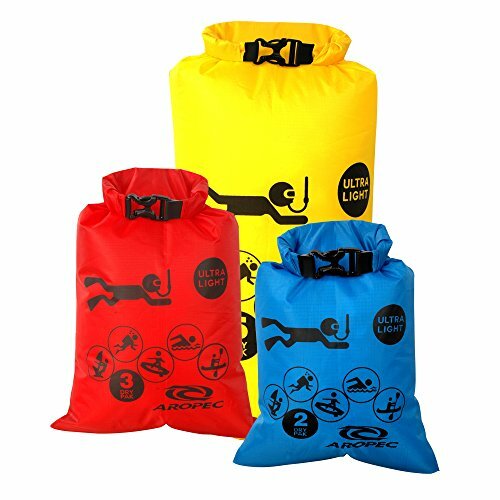 Aropec Dry Bags keep your belongings safe for kayak fishing, camping, boating, rafting, canoe trips. Dry Bags will not replace a PFD but can be used as a supplemental emergency flotation device. It floats when sealed with air trapped inside. Having dry gear available can be crucial for your survival. AxiCore Snorkeling, Scuba Diving, Swimming Mesh Bag. Swim Fin Mesh Gear Bag. Double Shoulder Strap so can be carried as backpack or slingpack. Durable Large Mesh Fin Bag.